Thought I’d share something fun with y’all. At the start of the school year, my friend’s 8-year-old son, Sam, informed me that he had chosen me to represent the state of Massachusetts for a class project. Later in the year, I’d be asked to host his Flat Stanley and take him around to various places of my own choosing. At each place, I should take pictures. For months I waited while Sam’s classmates (who were responsible for two states each) covered the country, and finally, it was my turn. So, these past two weekends, I took Stanley around, showing him all the important sights you’d want to show a cardboard cutout. 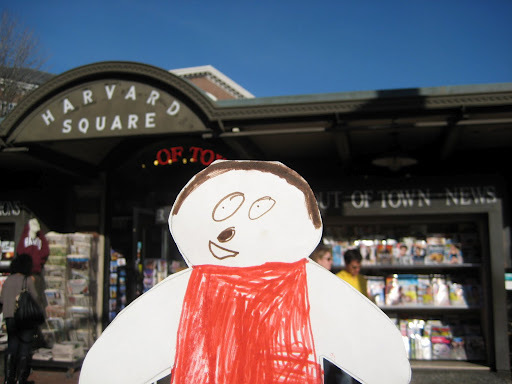 We went to Fenway Park, Faneuil Hall, the State House, the Freedom Trail, Harvard Square, Cheers, Copley Square, MIT, Sugar Heaven, and more. I have to admit, it was good, albeit slightly awkward, fun for me. Every time I’d take Stanley out of the envelope, someone with a kid would walk by and yell, “Hey look! He has a Flat Stanley!” or something like that. When I stood next to a Duck Boat to take a picture, multiple people on the tour commented on what I was doing and laughed. But that said, it was amazing to me how many people knew exactly what I was doing because they’d either done it themselves or had seen someone else doing it. And some were really nice about it. A guy at Fenway let me park in a no-parking zone so I could get a quick photo. 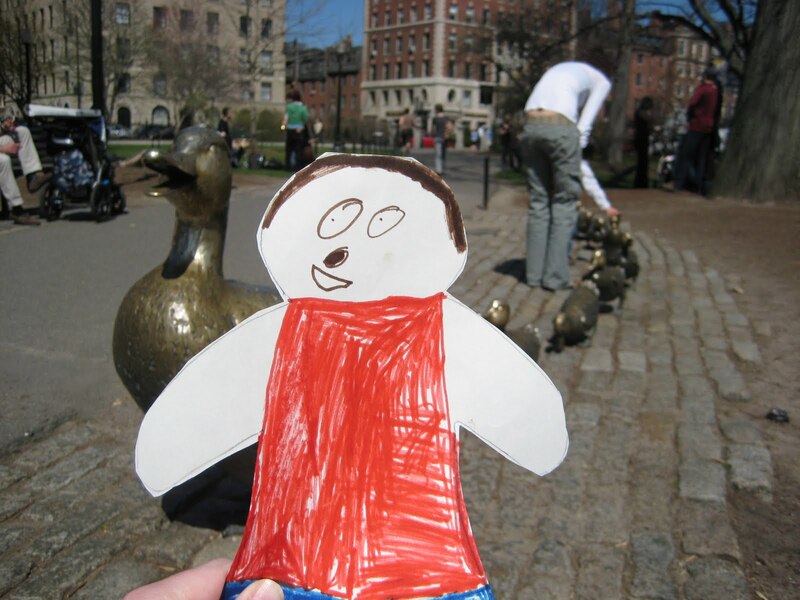 One of those Revolutionary War soldier guys on Boston Common posed for a picture with Stanley. And a woman at the Coop in Harvard Square didn’t just refrain from laughing when I asked about putting Stanley in one of the tshirts — she went and got me some tape so he’d stay still. Anyway … the photos from Stanley’s tour are amusing, so I thought I’d share. Anywhere else you’d have gone?